"Women are shouting out, which is high time and also serious. We must take this opportunity to make sure that what is happening now will change everyday life for real. "Life in the workplace is the most important here. That's why I have invited the labour market parties to talk about #metoo and how we can strengthen our work. Criminal activities should of course be reported to the police, but this is also about unwanted behaviour, unacceptable behaviour, unacceptable and undignified working environments, and how this can be part of the systematic work to improve working environments." Sweden has just strengthened its work to systematically improve the working environment with new rules for organisational and social working environments. New legislation aims to make sure all workplaces introduce preventative measures and secure gender equality. "Women have used the hashtag #metoo in trade by trade to tell their stories. This is obviously not an issue which has been part of the systematic work to improve working environments. I think it has been very wise to link this to the terms covering different trades," she says, and underlines the importance of what is now happening. "I believe this is incredibly important and incredibly big. It is very good that women finally speak out about what women have been victims of - always, but it has been so quiet." "How do they work with this? What do we need to do more of?" Do you worry innocent men can be prejudged? "Right now it is important that women finally speak out. It is then the responsibility for us as politicians and the labour market's parties to make sure that this becomes an important part of the daily, systematic work to improve the working environment. I think gender equality issues have not been a priority in the daily work out in the workplaces, and employers carry an enormous responsibility. It is incredible that this is going on to such an extent without employers reacting. This needs to change." Will you bring this up on a Nordic level? "I think that if we are to continue the discussion on working environments, then this is an important issue in the systematic work to improve the working environment. 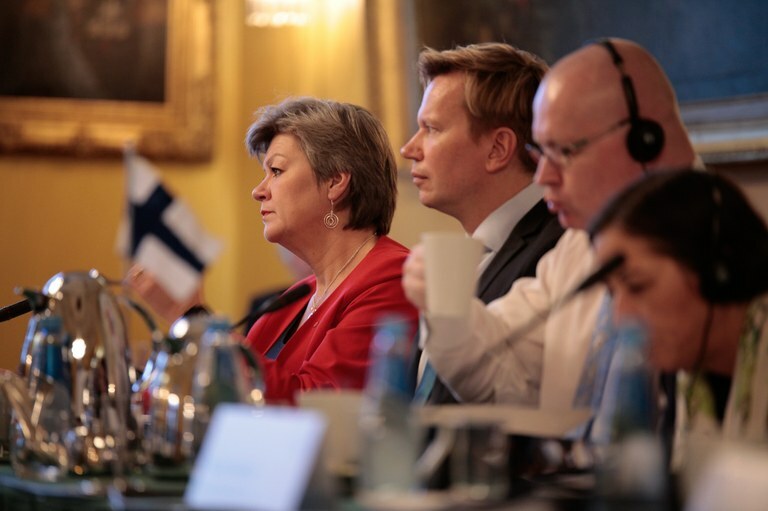 Finland took an initiative for further cooperation which we must now consider how to carry forward. This could be one way of doing it." In 2018 Ylva Johansson will invite her colleagues to a ministers' conference on workplace integration with a special focus on women. "The Nordic region is advanced when it comes to gender equality. Women fleeing from other countries have very different experiences, and it is difficult for them to understand Nordic equality. This is where the exchange of experiences can be useful." Ylva Johansson has also invited the Canadian Minister of Immigration, Refugees and Citizenship, she tells the Nordic Labour Journal enthusiastically. "He would love to come to Sweden to learn from the Nordic experiences, and I think we can learn a lot from Canada." In continuation of the focus of the employment ministers in Oslo, a conference on the future of work will be held next May. In Sweden the focus will be on digitalisation, automation and artificial intelligence. A main issue will be the consequences for lifelong learning and the need for skills development in the face of this situation which will have an impact on many people's jobs. In August there will be an experts' conference on unhealthy competition in the labour market and work-related crime. "Sweden has learned a lot from Norway, which has focussed a lot on the fight against work-related crime and social dumping." In late autumn, she says, there will a Nordic experts' seminar on PIAAC, the Programme for the International Assessment of Adult Competencies. This is also relevant when it comes to how we deal with this in relation to new citizens. "The Nordic countries have seen an education revolution which has led to a very high competence level. We now need a new imperative. The experiences from PIAAC can be relevant here." 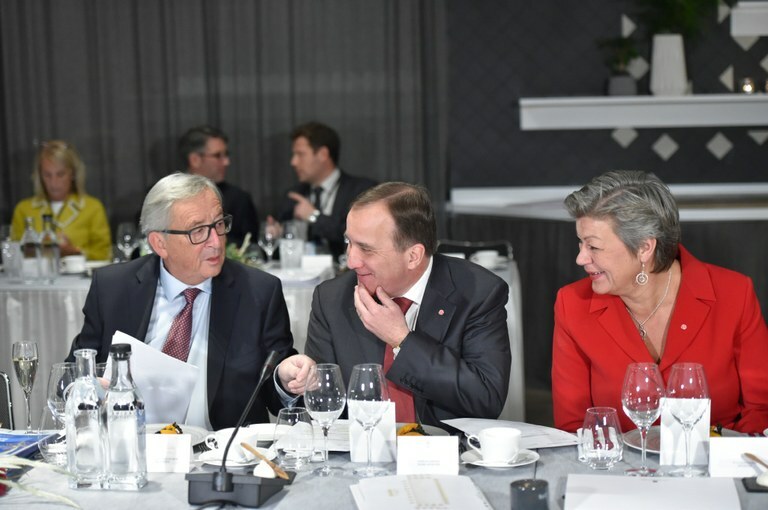 The EU Commission President Jean-Claude Juncker, Sweden's Prime Minister Stefan Löfven and Minister for Employment Ylva Johansson at the Gothenburg EU summit. Photo: Mikael Sjöberg, Swedish government. Last month the EU social summit was held in Gothenburg. Ylva Johansson had been working hard to make this happen. The engagement it created surprised her, she tells the Nordic Labour Journal. "Not least among the heads of state and government. I spoke to Guy Ryder from the ILO, who said 'something has happened in the EU. There is something new in the air'. I felt the same way. "The meeting as such led to few formal decisions, but it feels like there is a momentum now. All the heads of governments and all the countries are very worried about increasing gaps between people and between countries, what this could lead to. "It was powerful," she says. The fight against increasing gaps has been part of Ylva Johansson's agenda since she became a minister in Stefan Löfven's government in 2014. "Of course Stefan was the one who made this happen, but I have been working to create acceptance for the social pillar, and it was my council of ministers that saw this through. We also managed to reach agreement on new rules for the posting of workers. So there have been two important issues in the work with the social dimension." Will this be important for Sweden's Presidency of the Nordic Council of Ministers? "To an extent, yes. What we are focussing on is gaps. This is about how to successfully integrate newly arrived people. If we fail here, new gaps will emerge. The Nordic labour market model is based on an unusual level of social equality. The question of how we maintain and use that strength when welcoming those who are new to our countries, makes integration an important issue during our Presidency. The women's perspective is important. The Nordic region is exceptionally good at gender equality. Many of those arriving here have fled from a different situation. It is of course a long journey arriving in a gender equal society." How important is the Nordic cooperation in your view? "It is enormously important. We have had 60 years with a common labour market. That is a fantastic strength for our countries, our economies and our peoples. "But I think many take it for granted. That worries me, so we need to be reminded every so often how much this cooperation benefits us. "I would argue that it means more than most people realise," she says.